But after suing some 35,000 music fans for illegally downloading songs, music honchos decided not to sue the more than seven million others. Instead, the industry has concluded that if it can't beat them, it might as well join them in enjoying the benefits of technology. This marks a milestone in what might be called the Great Unbundling. I was dead scared for a few years that this might happen too early. What frightened me was the thought that the CD would be replaced as the primary music distribution medium by MP3 or similar downloads. Imagine if most music could only be obtained as a digital track compressed with a lossy CODEC. Now, though, I think that there will be sufficient bandwidth (and portable player space) to allow lossless compression systems to be used. Perhaps at a premium over the standard AAC or WMA version, but I wouldn't mind that. There is war in the world, and possibly a major economic problem, so I am going to outline the reasons I like Blu-ray with reference to my experience last Thursday night. My wife and I had some time to kill, so we went to the nearest convenient cinema to see The Curious Case of Benjamin Button. We both rather enjoyed the movie, but this post isn't about that. It is about the pros and cons of Blu-ray. The cons of Blu-ray are few: I have to wait longer to see a movie (it was only the other night that I finally saw The Dark Knight), and there is an increased danger of the accidentally learning of twists and surprises in a story prior to seeing the movie. At home my Blu-ray movies start on time. In every case (so far) I can skip unwanted trailers and the like, so there is rarely more than a couple of minutes delay while I get the projector warmed up. At Hoyts a movie scheduled to start at 8:50pm saw us being admitted five to ten minutes late, and then having to endure several advertisements and at least four movie trailers. My guess: the movie started at least 20 minutes after the advertised time. At home my Blu-ray movies end on time. The Hoyts program promised a finish of 11:51pm. We were supposed to pick someone up by midnight. I suggested to my wife that I'd be prepared to make the major (for me) sacrifice of departing as soon as the final credits began to roll in order to make it. The final credits actually began to roll after midnight, so half way through the movie I found myself sending text messages, warning of delays. At home my Blu-ray movies sound wonderful. Actually, the movie sounded okay at the cinema too. But all those trailers and advertisements leading up to it didn't. They were obviously on optical tracks printed to the film, and heavily scratched as were several of the prints, with one having a continuous scratch throughout its entire run time right down the centre of the screen. The crackles made that clear. They were turned up loud and the distortion levels were very hard on my ears. At home my Blu-ray movies have the correct aspect ratio. That also was largely the case for the movie at Hoyts. But not entirely. The last advertisement before the movie was showing stretched horizontally into a 2.35:1 aspect ratio, making its contents short and squat, and even showing black bars to the top and bottom. Then the movie started up, showing the Warner Bros and Paramount logos (apparently this was a co-production). The logos for both were tall and skinny. The masking curtains were in for a 1.85:1 aspect ratio, so it seemed that the picture was not enjoying the benefits of an anamorphic lens. Fortunately, within a few seconds the curtains were opened up and the appropriate lens put into place, correcting this. At home my Blu-ray movies are sharply focused. This was not the case at Hoyts. At home I get decent black levels. At Hoyts I would estimate the black levels to be consistent with a contrast ratio of about 2,000:1. The many dark scenes in this movie lost a lot of detail. That will teach me to go to the movies! Lately I have been devoting my website attentions more to my Blu-ray vs DVD comparison shots than I have to this Blog. Most of them haven't really been worth commenting on individually here, but now an unusual one has arisen. 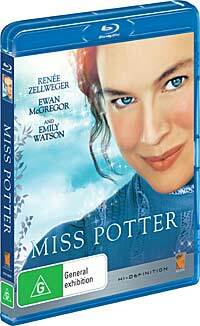 Miss Potter is a British produced biopic about the childrens' book author. Icon Film Distribution kindly sent me a copy of both the DVD and the Blu-ray release. I promptly set about entering their specifications into my database. The theatrical showing of the movie had, according to IMDB, a run time of 92 minutes. As expected, the DVD had a run time of nearly 89 minutes. The shorter run time is that as with most PAL DVDs, the film frames were transferred one for one to the DVD frames. Since PAL DVD runs at 25 frames per second, the film plays a little faster. About 4% in fact. Since Blu-ray movies are played back at 24 frames per second, their run times should be the same as the theatrical showing. But on Blu-ray, this movie was also nearly 89 minutes long. It took a while for the penny to drop. Eventually I realised that I now had in my collection the first Blu-ray movie I had seen which was not recorded at 1080p24, but at 1080p25. Why Icon would do this I have no idea. But it is nice to see something unusual. In addition, the special extras use the Australian standard definition resolution of 576i. I see that Sound and Image has put my review of this high-end, $AUS10,999 home theatre amplifier on-line. Read it here. Interesting article here about the differences in sound quality between the various forms of DTS and Dolby Digital and the new lossless formats, in which actual controlled listening tests are conducted. Bottom line: differences are subtle. 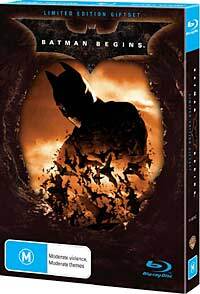 As is Warner Bros' habit, the Blu-ray of Batman Begins doesn't really have a main menu. When you insert the disc, the player shows an FBI warning, then the Warner Bros logo, then reads off some BD-Java code and then starts playing the movie straight away. If you want to do something you hit the pop-up menu button. The 'Top Menu' button doesn't do anything. When the movie gets to the end, the disc runs through some copyright panels, and then presents the 'Special Extras' menu over a still shot from the movie. Because there are very extensive special extras, this menu is quite large. In fact, it seems to use rather more than a half of the screen area, and because it is presented as a box, it looks like it uses even more. If you invoke this from the pop-up menu (which is presented as a bar across the bottom of the screen), it appears in different ways depending on the player. For the Sony Playstation 3, it slides smoothly up from the menu bar over the course of a second or so. With the Yamaha BD-S2900, which I have the disc in right now, it also slides up, but just a little jerkily. A couple of months ago I used the Olin OBDP-1000 Blu-ray Player, and this also slid up the extras menu, but very jerkily, as does the Samsung BD-P1500. However, if I use the Sony BDP-S350 or BDP-S5000ES Blu-ray player, or the LG BD300 (from memory, this one, so I could be wrong -- I had to surrender it back to LG), the menu just snaps up into place instantly, rather than slides up. Different BD-Java implementations in the players, perhaps? Incidentally, one especially nice thing about Batman Begins is the BonusView PIP feature. The information it offers is interesting enough, but I'm talking about its implementation. Every other BonusView feature I've seen, so far, essentially requires the movie to restart. This one just switches it on or off at the point in which you're in the movie without otherwise affecting playback. UPDATE (Tuesday, 23 December 2008, 10:07 pm): I have the LG BD300 Blu-ray player back. Yes, I was right: it makes the menu on this disc snap up into place. In the dying moments of the First Cricket Test match for this season between Australia and New Zealand, one of the TV commentators remarked that the Australian bowler Mitchell Johnson was noted for being able to produce a 'heavy' ball. This, he said, was a ball that seems to hit the bat harder than its 140kph nominal speed because Johnson is such a strong man. Bloody hell! I had no idea that there was this spiritual quality of 'strength' that can attach to a ball, quite independently of its velocity. Does the delivery of each ball diminish Johnson's stock of 'strength'? Does it come back in time if Johnson rests? Can he transfer this strength to objects other than cricket balls? Can he, perhaps, lay his hands upon someone suffering extreme ennui and thereby restore their zest for life? Back to reality: I do hope that this commentator doesn't coach bowling. How hard a ball hits a bat depends upon the ball's mass and velocity at the time it strikes the bat (I'm assuming friction between the bat and ball is fairly low). The only way, for a given speed of delivery, for a ball to strike in a more 'heavy' manner is for Johnson to substitute another, heavier, ball, thereby increasing both the momentum (=MV) and kinetic energy (=0.5MV^2) of the ball, or for him to employ some trick. Since the former is cheating, I shall assume the latter. A large portion of the delivery speed is washed off between the time when the ball leaves the bowler's hand, and when it arrives at the batsman's crease. Some of this is from air friction, but the bulk is lost when the ball hits the pitch. If Johnson is able to impart some top spin to the ball during his high speed delivery, this could reduce the amount of speed lost. Another possibility is that this is simply in some cricketers', or cricket commentators', imaginations. It's a bit like that with home entertainment stuff. Some listeners decry technical or 'reductionist' explanations of how well (or otherwise) these things perform. Some suggest that the human ear is the most sensitive instrument. Which is silly, because the ear isn't an instrument at all. It is a bodgey tool developed by evolution to do a specific job which has nothing at all to do with measurement. It is intended to provide enough information to allow our equally bodgey audio processing circuits to generate a tolerably accurate aural picture of the world around us. Most importantly, to do this at high speed. Having a higher accuracy picture isn't much use if during the time it takes for all the processing to be completed the cheetah that was creating the sound has raced up and bitten off our heads. If you can hear or see differences between two pieces of equipment that their specification sheets don't seem to suggest, that doesn't mean that they won't measure differently. Measure the right things with technical equipment, sufficiently finely, and in the right conditions, and you can define every discernible aspect of its performance. But it may still sound different to different people from time to time because we also have imaginations, hormones, moods.